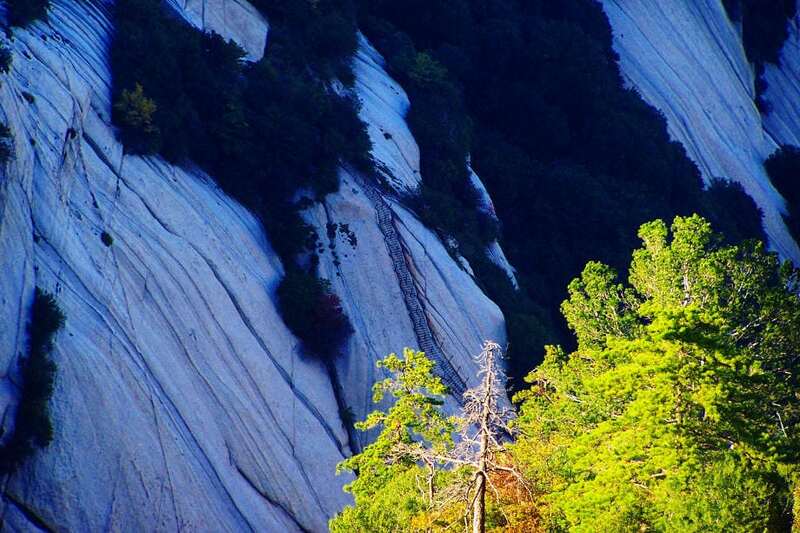 In this article you’ll find all the information you need to visit Hua Shan. 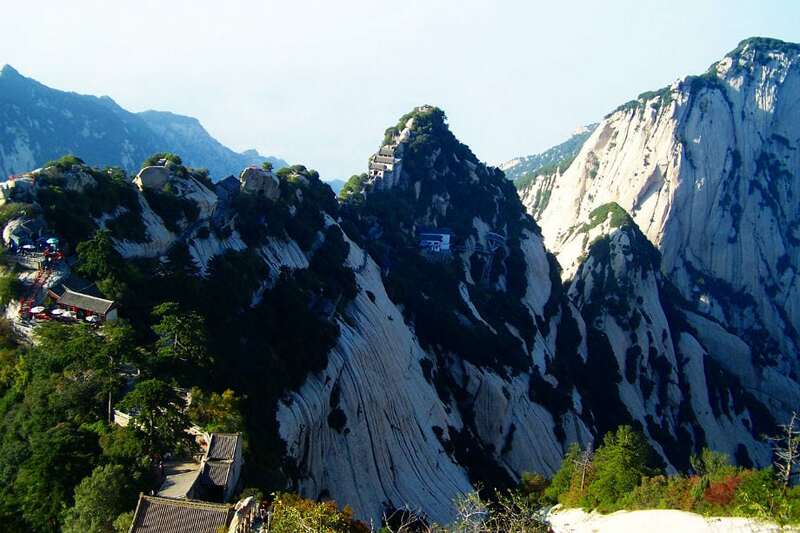 Mount Hua or Hua Shan (华山, literally “The magnificient Mountain”) is one of the five sacred mountains of China and is located about 120 kilometers east of Xi’an. 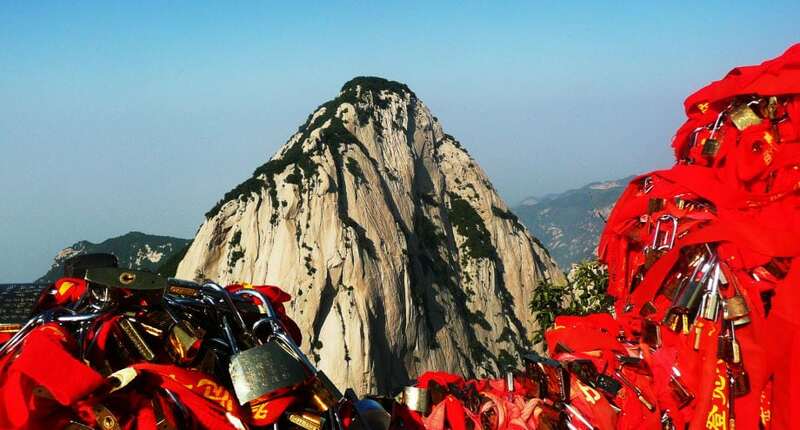 Hua Shan is also been known as the “most dangerous hiking trail in the world” but, as I’m going to explain later on this article, no hiking skills are required to enjoy this amazing scenario. 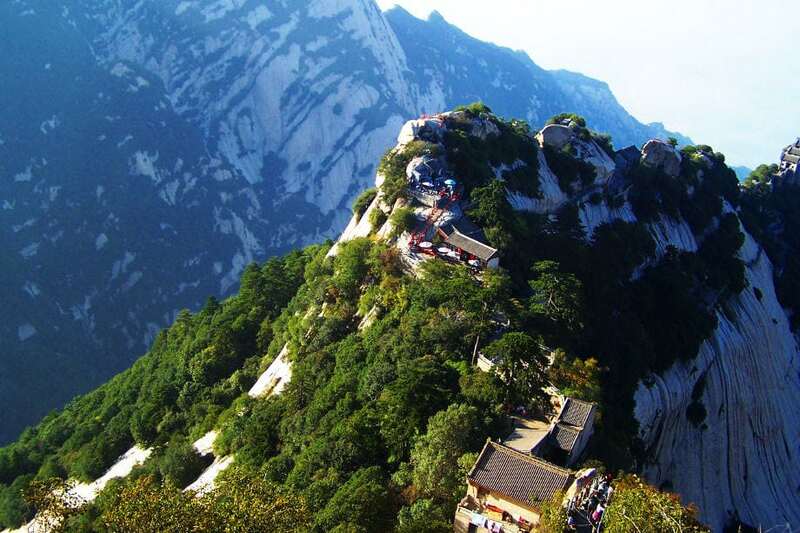 The easiest way to reach Hua Shan is to arrive in Xi’an and then take the train or the bus. While the train is the fastest way the bus is more convenient because you don’t have to buy the tickets in advance. Moreover, the bus leaves you much closer to the mountain. The closest station to Hua Shan is Hua Shan North Train Station (华山火车北站, Hua Shan Huoche Bei Zhan). There are many trains that stop here from Luoyang (Henan Province), Zhengzhou (Henan Province), Datong (Shanxi Province), Xi’an (Shaanxi Province). Even the fast train Beijing-Xi’an stops here. The prices and the duration will vary a lot depending on the train’s type and on the departure station. Just as an example, the fast train from Xi’an takes half an hour and cost 55 Yuan. Once you arrive at the train station, you can take a minibus to the mountain. Also, you can get a cab (it should cost around 20-30 Yuan). There is a touristic bus that leaves from the East side of the train station; it’s the same spot where you can get on the bus to visit the Terracotta Warriors. You just need to find a bus with the characters “华山” written on top. The ride takes two hours and the ticket costs around 30 Yuan. Notice that buses only depart when they are full so don’t chose an empty one (unless you enjoy to wait in the parking). Once you get off the bus just walk to the entrance of the park. Tuk tuk drivers (here the tuk tuk are called 蹦蹦车, bengbengche, literally “jump jump car”) or taxi drivers will tell you that the entrance is so far. However it only takes around 15 minutes walking (go up direction to the temple). If you don’t want to get lost and decide to take a ride, it shouldn’t pay more than 10 Yuan. 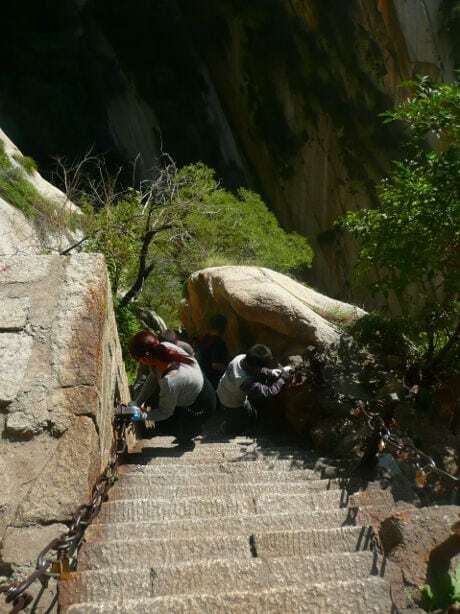 The first part of the main HuaShan trail, difficult isn’t it? The entrance ticket to the Hua Shan Park cost 180 Yuan (you can get a half price discount with a student card). Notice that foreign student cards may also be accepted (I oet the discount with my expired Spanish University student card). 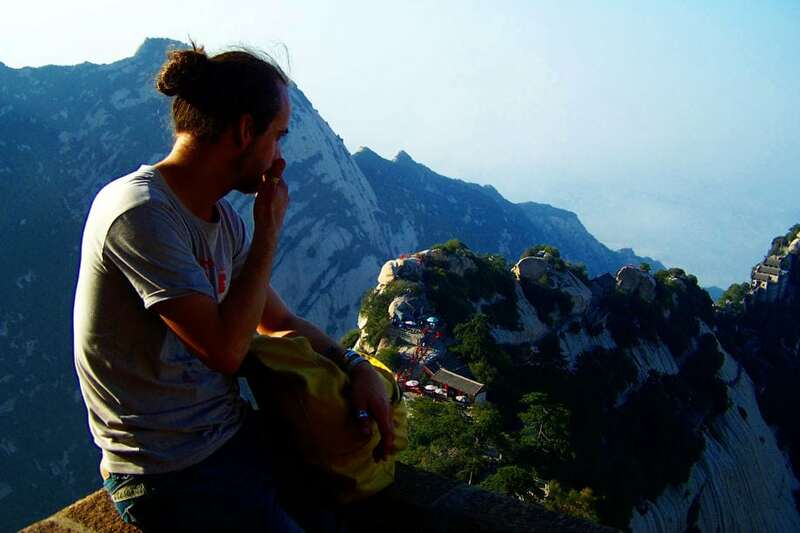 Even if you arrive by bus, there is enough time to visit Hua Shan and come back to Xi’an during the same day as the last bus departs between 5 p.m. and 7 p.m (depending on the season). Also, there are trains until 11 p.m. However you may want to enjoy the sunrise and the sunset on the mountain: in this case you can spend the night at one of the guest houses on the top (normally only shared rooms are available). If you don’t want to rush your visit and also enjoy a comfortable sleep, you may want to spend the night in town. 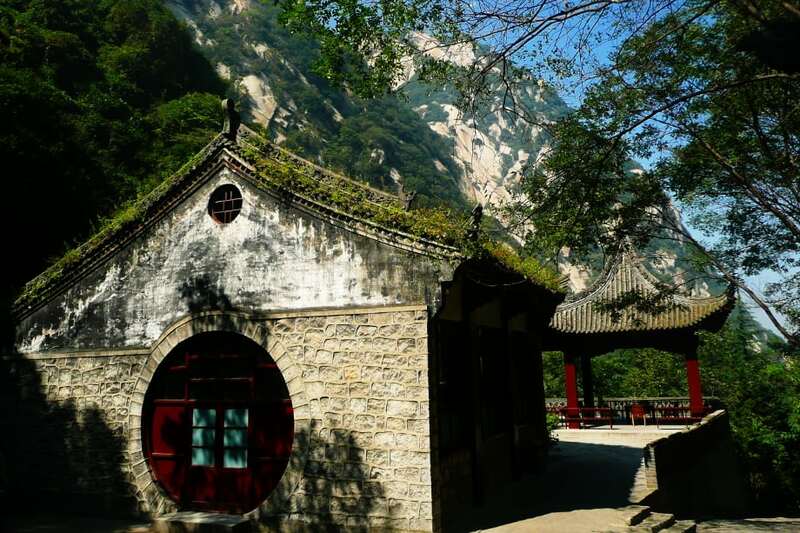 In this case I’d suggest you to stay at the Weinan Huashan Baolianshe Youth Hostel or, even better, at the Huashan Gehui Hotel. They are both located near the park’s entrance and are quite comfortable. 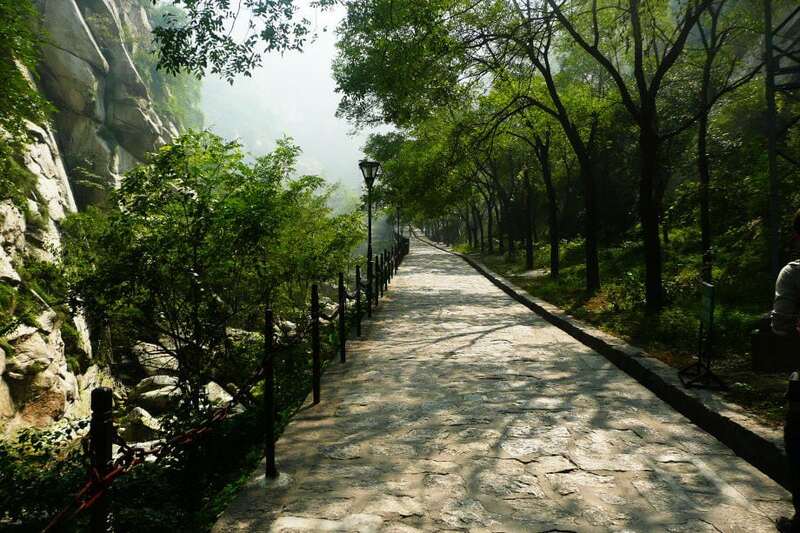 For more information on where to stay near Mount Hua, click here to view other hotels that we recommend in the city of Weinan. If you are looking for more practical information you may want to check Wikitravel. In the second part of this article I’ll talk about my personal experience and impressions. If you google “Hua Shan” you’ll find many articles titled “The most dangerous hiking trail in the world” or similar. If you click on them you’ll find a lot of pics of steel ladders driven into a hole in the rock, rotten wooden planks not wide enough for your feet and so on. All these at the edge of a scaring cliff. 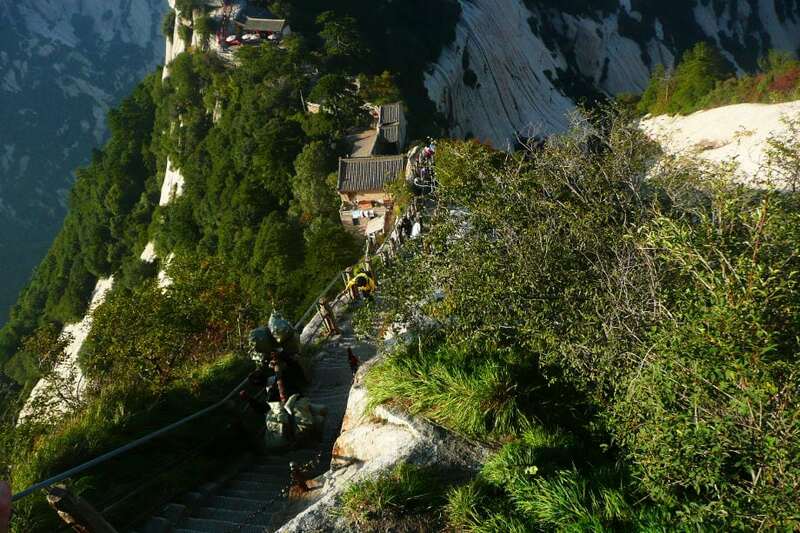 If you suffer a bit of fear of heights you may think that Hua Shan isn’t for you. The truth is that all those photos are taken in a small section of the trail (called 长空栈道, Hangkong Zhandao, literally “Vast Sky Plank Walk”) that isn’t necessary to cross in order to reach the top. Also, since the infamous “most dangerous hiking trail in the world” became a popular tourist attraction isn’t dangerous at all as it’s mandatory to use safety harness. The answer is “yes”. There are two paths to reach the top: the “easy” path and the “difficult” path, also called the “soldier’s way”. I must say that both of them have some difficult sections but, if I was able to reach the North Peak in less than three hours, you should too. Why? Because I don’t regularly exercise, I smoke twenty cigarettes per day, I live in Beijing (one the most polluted cities in China) and if all this it’s not enough I’ve worked in a lab more than ten years surrounded by harmful and volatile chemicals. I think you don’t need to be a doctor to imagine that my lungs aren’t 100% efficient. F**k, I just need to start eating junk food daily to win the price as the healthiest person in China! 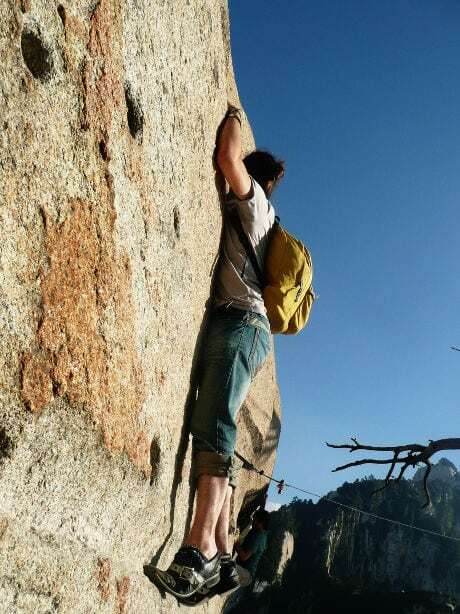 Also you should consider that even Chinese tourists, the antithesis of fitted people, managed to get to the top. They maybe took six hours, but they got there. And no, here you can’t find any gurney service as at the Emei Shan! Finally, if you are too lazy you can always get the cable car to the North Peak (80 Yuan one way, 150 Yuan return ticket) or the recently open cable car to the West Peak (140 Yuan). In this case be prepared to queue with thousands of Chinese tourists. Me at the top of the Northern peak, I did it! If you’re a bit careful, Hua Shan isn’t dangerous at all. I’ll now provide you with you two examples of people that survived the experience even if they did act careless (don’t try this at home). The first bad example it’s from myself. If you’ve read our previous article “Climbing Mount Emei: Invisible monkeys, gurneys and canes“, you may know that I’m infamous for climbing sacred mountains wearing flip flops. Nope, I’m sorry but this time I forgot my winter flip flops at home: I was wearing the much more appropriate “Yakutza shoes”, a kind of shoes popular in Japan in 2006, when I went there. The problem with these shoes is that they have a long and empty tip that makes almost impossible to climb stairs, especially the ones in Hua Shan. The surprising thing is that a lot of them were able to get to the top wearing ten inches high heels. Ok, it isn’t entirely true as I saw many poor boyfriends carrying up their princesses (I’m sure they also miss the Emei’s gurney service). HI I am travelling with my husband and kids (19, 19, and 20 year olds!) and after seeing the terracotta army would like to visit Hua Sahn. However we are visiting in the second half of February/early March, is this still possible or are the paths closed in these months? please advise! I don’t think will be any problem, but I can’t be sure. The weather conditions at this time of the year are unpredictable. 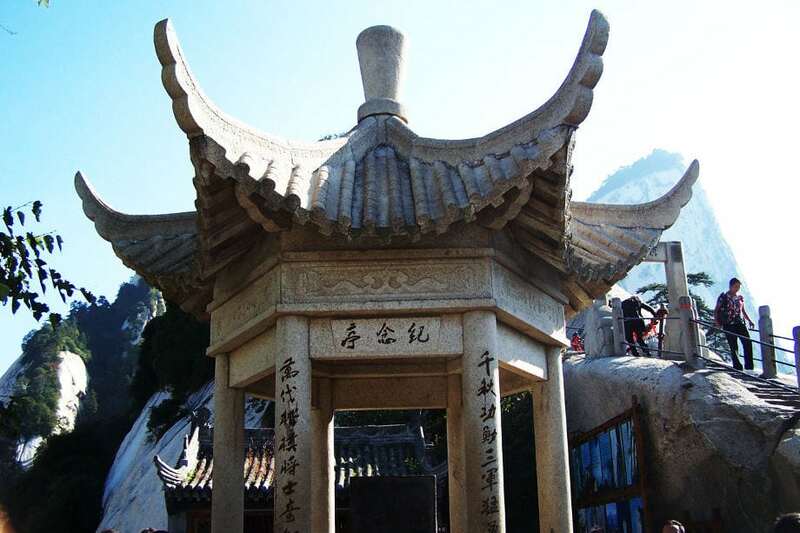 In your story, you mentioned Huashan Gehui Hotel. I’m gonna stay at that hotel and make 2-day trip at the mountain. I just want to ask you if the hotel is very near the entrance or which is the nearest entrance I can get to to access the mountain? Also, do you happen to know how to get from Huashan train station to the hotel? I’m currently lost of where the hotel is located. I’m afraid that if I take taxi, he won’t know where the hotel is or worse if he will scam me. Hi, the hotel is about 15 min walk from the Huashan WEST gate, about getting to the hotel I suggest you to get a taxi (remember to bring the address written in Chinese), don’t worry usually in China taxi drivers aren’t scamers, and if they scam you it’ll be about 1-2 USD. The ride should be around 20-30 Yuan, they should use the taximeter but in this kind of small towns is quite common you have to agree a fixed price. The taxi driver will know the hotel, and if not he’ll ask other people. This post brings back huge memories for me. Myself and some friends did an early morning hike (with head lamps) to watch the sunrise. While we did get there a bit late to catch all of the sunrise, it was a fortunate change. My friends said, had they seen what we had just climbed up in the day, they would have taken much longer. Some of us decided to take the cable car down on our return to Xi’an. While Hua Shan is not the most visited attraction in Xi’An it is one of my personal favorites and looking forward to going back.